ABOVE: David Smith, Hudson River Landscape, 1951. Welded steel, 49 1/2 x 75 x 16 3/4 inches. Whitney Museum of American Art, New York, Purchase. Photo by David Smith © 2006 The Estate of David Smith/Licensed by VAGA, New York. Marking the boundaries of this transitional period, as Smith shifted from the use of figurative symbols toward a greater concentration on the terms of sculpture itself, are a group of sculptures he made on the theme of landscape. 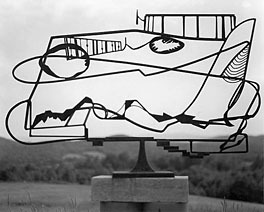 From 1946 to 1951 Smith made a total of 15 sculptures titled Landscape, as well as at least ten other closely related pieces. He came to this theme through his lifelong preoccupation with the intersections of painting and sculpture: of the established genres in the history of painting, landscape is the one most concerned with the transposition of three-dimensional space into the two-dimensional plane of the painted surface. Many of the artist’s landscape works simulate this picture plane by incorporating a rectangular frame within which smaller sculptural elements interact; in others, various objects lined up along an oblong sculptural base suggest structures standing on a distant horizon.